What Affects Your Auto Insurance Bill the Most? What is the Average Monthly Cost of a Premium Today? Because the minimum liability requirements and regulations vary from state to state, an across-the-board average for the monthly cost of automobile insurance would probably not be of much use to consumers. However, if you are determined, you can purchase a non-bias report at www.naic.org/store. The information, drawn upon actual data taken from written premiums and exposures beginning as far back as 2006, will cost you $220.00. 2.6 Gaps in Coverage – Don’t let Your Premium Lapse it will Cost You! Below is a table of the average cost of a premium for each state. This list includes all drivers including those with a poor driving record. This table shows the average cost of an auto premium for drivers which do not include those with a poor driving record. Also, it includes the cost over 3 and 5 years. Which illustrates the high cost an auto bill over 5 years ranging from $3,000 to $6,000. Even though the report, 2014-2015 Auto Insurance Data Base, contains information that influences the cost of insurance, it is not worth the price if you are only interested in an average monthly cost to a consumer. The following quick list of factors, used by insurers when calculating premiums, is why I deem a combined monthly average cost not helpful. Note: As illustrated, each carrier uses some or all listed determining factors. Some weigh more and some less. This is for illustrative purposes only. Note: Typically your driving history is going to be the main determining factor when retrieving a quote. Not only do state minimum requirements and regulations vary greatly, but zip code to zip code within a state can result in a considerable difference in prices – for the same policyholder! Because automobile premiums are state regulated, drivers expect an unstable price range in premiums from state to state; however, it is often surprising to a policyholder when they move from a rural area to inner city and they see an increase in their rates. Agents and companies use demographics from a zip code to determine risks for each area. Furthermore, there is no set standard for the industry, so each company may put different weight to each risk factor they include in their formulation. It does affect your bottom line. If you live in a more remote area, insurers often consider many risks lowered. As population increases within a given area, statistics prove that crime rates increase, and of course, if there are more people residing in an area, there is more traffic. 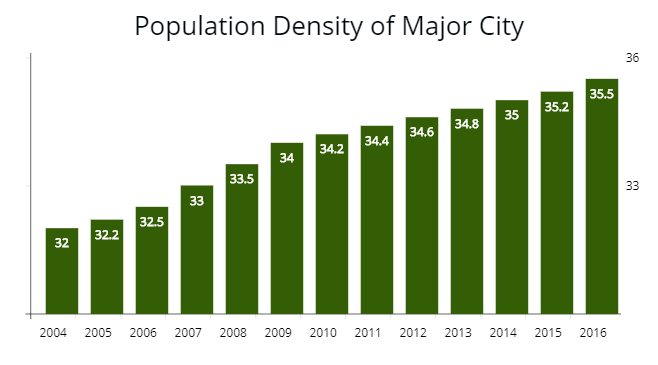 Note: The population density increased from 32 people per square kilometer in 2004 to 35 in 2016. In the instance of your auto premium if you reside in an area with a population increase you could expect a higher rate. This graph is for illustrative purposes only. Larger cities, especially those with major industries, can sometimes double their population with commuters during the day, and so the accident risk rises even higher. Along with higher risks, comes a higher rate of claims against an insurer and because insurance companies are for profit business they most assuredly will use their own claims history for your zip code in the calculation of your quote. Your location can also affect premiums in more obscure ways. For instance, if there are a large number of lawyers within a zip code insurers see this as an increased risk of lawsuits against them. Even the lay of the land may affect a policyholder’s premium, floods or extreme winter weather; it all boils down to what the insurer views as a threat to the company’s stability and success. It is rather obvious that a bad driving record will make it difficult to find cheap car insurance. Do not spend too much time beating yourself up over a sketchy record. On one hand, a bad record does mean a higher insurance premium, but on the other hand, it does not have to be permanent and there are ways to get those rates down some. Note: In this example, one driver had a couple of driving violations which spike the cost of an auto premium. Only after 3 to 5 years did the premium settle to a more reasonable price. Taking a defensive driving course, can help to lower your high-risk premium and entering your zip code into the free quotes box at www.autoinsuresavings.org will bring competition into the mix, which usually results in lower prices. Of course improving driving habits will eventually clean up a driving record and in turn lower a policyholder’s rates. Newer vehicles and those with more expensive replacement parts, as well as vehicles with lease or loans attached, will result in higher costs. Same goes for those sporty, racecar style favorites like mustangs and corvettes. It is not just a policyholder’s age that may affect an auto insurance quote, but also any other household members of legal driving age. This means that if you have teens, you might see an increase in your policy rates because insurers consider their inexperience a higher risk. Note: The cost of an average premium is extremely high for young drivers. Lower for middle aged drivers then begins to increase after the age 60. Even if your teen does not have a license, the insurers believe they will drive the family car at one time or another. Male drivers, young and unmarried in particular, statistically show a higher occurrence of accidents. More accidents as a single demographic group equates a higher cost of insurance for anyone included in that group. Some occupations may actually earn you a discount, or lower premium. A scientist, for example, is astute at noticing details, making assessments and adjustments, all of which translate into good driving habits. Other careers can have the opposite effect on the cost of automobile premiums. Just imagine what it costs to insure a racecar driver. For some policyholder’s it is the mileage that causes an increase. Safe driver or not, Semi drivers or regional sales people are on the road much more than someone who works at one location near home, and they will probably pay a higher premium because of it. Gaps in Coverage – Don’t let Your Premium Lapse it will Cost You! The last price-determining factor mentioned in my list does hold the potential to be very costly to a policyholder. When a car owner/driver allows for a lapse in coverage, the insurers consider this an increased risk. Note: This graph shows what a lapse in coverage would do. In this instance, the driver saw a spike from $160 to $300 per month. Often, state law mandates that providers alert the Department of Motor Vehicles of a lapse.. This can result in fines, license suspension, or even time in jail. All of this is in addition to a guaranteed increase in your auto premium. My list is far from all-inclusive, but I do believe my argument for calling an across-the-board average monthly cost of car insurance “not advantageous” for the average consumer (even at state level). For an average cost to be of use to consumers they would have to add filters, just like when trying to narrow a search for something online. Penny Adams is a freelance professional writer. Articles written are original, highly researched, and complete with sources listed. When not writing or telephone fund raising for non-profit organizations, I enjoy spending time with my daughter and granddaughter, growing food, and exploring the great outdoors in Michigan. On 10/17/2017 / Auto Insurance Quotes / Comments Off on What Affects Your Auto Insurance Bill the Most? What is the Average Monthly Cost of a Premium Today? What is the Best & Cheapest Coverage?